Hyperlocal news and information aggregator Everyblock has launched a new location-based widget targeted at local newspaper websites and blogs. The widget allows third party sites to embed Everyblock’s news and information feeds for specific areas on their own sites. The site was created by Adrian Holovaty in 2008 as a hyperlocal news resource for neighbourhoods in Chicago, New York and San Francisco. It has since expanded to 16 US cities and was bought by MSNBC in August 2009. This entry was posted in Hyperlocal, Local media, Online Journalism and tagged Adrian Holovaty, EveryBlock, Hyperlocal, msnbc, widget on August 4, 2010 by Davet Hyland. The growth of online watchdogs: are they ‘journalism’ and does it matter? The influence of UK-based democracy organisation, mySociety, often gets forgotten, perhaps deliberately downplayed, in the British press. Let’s go back to the MP expenses row, for example. Well before the Telegraph played its central role in exposing the various scandals, mySociety saw a significant campaign victory when Gordon Brown U-turned on an attempt to keep certain MP expenses details private, back in January. At the time, mySociety’s founder, Tom Steinberg said: “This is a huge victory not just for transparency, it’s a bellweather for a change in the way politics works. There’s no such thing as a good day to bury bad news any more, the internet has seen to that.” But did mySociety’s, in my view, undeniably influential part get reported in the UK press? Not really. So it was good to see that in Guardian editor Alan Rusbridger’s speech at the Media Standards Trust event earlier this week, all of which will be available to watch here, he opened with examples of online projects (two mentions for mySociety) – that do exactly what newspapers do – or used to – do. Is it journalism, but does it matter, he wondered. This entry was posted in Comment, Events, Online Journalism and tagged Adrian Holovaty, Alan Rusbridger, EveryBlock, fixmystreet, Gordon Brown, guardian, Guardian editor, Media Standards Trust, MP, mySociety, news matters, online projects, online watchdogs, reporter and a photographer, the Cotswold Journal, the Telegraph, The Times, theyworkforyou, Tom Steinberg, United Kingdom on July 24, 2009 by Judith Townend. This entry was posted in Editors' pick, Online Journalism and tagged Adrian Holovaty, Data journalism on May 21, 2009 by Laura Oliver. EveryBlock is aiming for coverage at micro not hyperlocal level, says Holovaty. “Micro implies intense focus, incredibly small scale and rich depth,” he says. This entry was posted in Editors' pick, Online Journalism and tagged Adrian Holovaty, EveryBlock, Holovaty on December 5, 2008 by Laura Oliver. 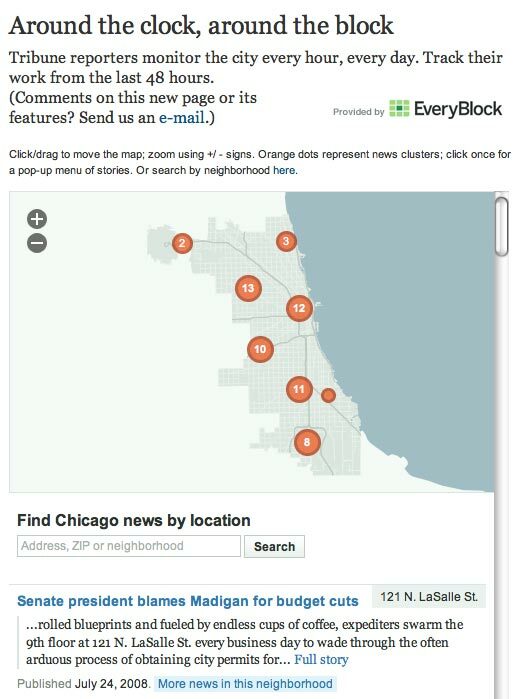 EveryBlock, the local news and data aggregation service, has gone into a beta partnership with the Chicago Tribune. The paper will publish a map and local news articles powered by EveryBlock, an announcement on the site’s blog says. Articles from the last 48 hours will be plotted on the Trib map to allow users to search geographically. “[I]t’s an experiment in a new form of news dissemination – that is, news filtered at the block level – and journalists can look to us for inspiration in new forms of publishing information. Second, we unearth a lot of government data that journalists might be interested in researching further,” EveryBlock founder Adrian Holovaty said in an interview with Journalism.co.uk. This entry was posted in Uncategorized and tagged Adrian Holovaty, Chicago Tribune, EveryBlock, Journalism.co.uk, Local, Mapping, The Chicago Tribune on July 24, 2008 by Laura Oliver. Hyperlocal news mapping site Everyblock has launched in two new cities in the US. Charlotte and Philadelphia join Chicago, New York and San Francisco as cities mapped by the site. Adrian Holovaty, founder of local crime news site chicagocrime.org, launched Everyblock at the start of the year as a destination where users could search for civic information and news items by address, postcode or neighbourhood on an interactive map. Holovaty started the site with a £550,000 grant awarded by last year’s Knight News Challenge competition. In addition to the public information already found on the city maps the new sites will add extra layers of content. 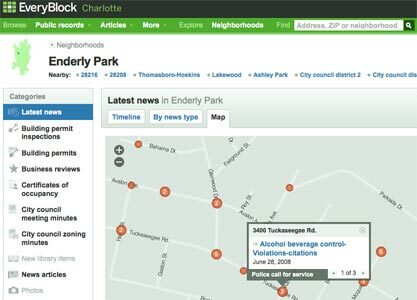 The Charlotte map will include library information, updating listings with new titles available locally and chart all local 911 calls to the police and ‘significant police events’ in the city. The location of series crimes will charted on the Philadelphia map along with areas mentioned by the local authority’s Streets and Services agenda bodies. Any area of Charlotte mentioned in city council meeting minutes or zoning minutes will be charted on that map. “We’re analyzing the text of these meeting minutes/agendas for all locations referenced therein,” wrote Holovaty. This entry was posted in Uncategorized and tagged Adrian Holovaty, Local, Mapping, USA on July 1, 2008 by Oliver Luft. We give developers the opportunity to tell us journalists why we should sit up and pay attention to the sites and devices they are working on. Today it’s aggregated news laid out across interactive city maps with Everyblock. I’m Adrian Holovaty. EveryBlock is an experiment in aggregating news at the block level in selected cities. Our site, which currently covers Chicago, New York City and San Francisco, allows you to view recent news for any address in the city. The idea is that we collect all of this information from across the web (and directly from city governments themselves) and slice it geographically, so you can stay updated with what’s happening near you. EveryBlock is useful to journalists in two ways. First, it’s an experiment in a new form of news dissemination – that is, news filtered at the block level – and journalists can look to us for inspiration in new forms of publishing information. We’re funded by a grant from the Knight Foundation, whose goal it is to promote innovation in the journalism industry, and we’re a test-bed for this idea. There is much, much more to come. As I mentioned above, we’ve only been around since late January. We plan to add more cities, more data and more features. This is an experiment. We’re doing it because it’s interesting, because it’s fun and because it’s an exciting new idea. The service is entirely free. Unlike some newspaper sites, you don’t even have to submit an evil registration form! We have the luxury of not having to worry about that for a while. We’re funded by a grant for two years, and we’ve only been working on this project for about seven months at this point. This entry was posted in Journalism, Multimedia, Online Journalism and tagged Adrian Holovaty, Chicago, Craigslist, Data journalism, EveryBlock, Geotagging, Innovations in Journalism, journalist, Knight Foundation, Mapping, New York City, San Francisco, trader, USA on March 14, 2008 by Oliver Luft.